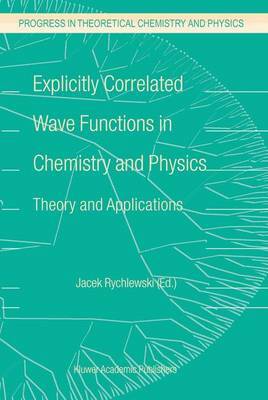 Explicitly Correlated Wave Functions in Chemistry and Physics is the first book devoted entirely to explicitly correlated wave functions and their theory and applications in chemistry and molecular and atomic physics. Explicitly correlated wave functions are functions that depend explicitly on interelectronic distance. The book covers a wide range of methods based on explicitly correlated functions written by leaders in the field, including Kutzelnigg, Jeziorski, Szalewicz, Klopper and Noga. The book begins with a chapter on the theory of electron correlation and then the following three chapters describe different types of functions that can be used to solve the electronic Schroedinger equation for atoms and molecules. The book goes on to discuss the effects that go beyond the Born-Oppenheimer approximation, theory of relativistic effects, solution of the Dirac-Colomb equation, and relativistic correction using ECG functions. The last part of the book reviews applications of EC functions to calculate atomic and molecular properties and to study positronic systems, resonance states of atoms and nuclear dynamics of the hydrogen molecular ion.